Flydubai flight FZ981 has crashed in the southern Russian city of Rostov-on-Don killing all 62 passengers and crew on board. The flight was en route from Dubai and crashed during its second landing approach amid poor weather conditions. Air-traffic control and local emergency services confirmed that the Boeing 737-800 jet crashed near the runway during a second approach in conditions of poor visibility. “According to preliminary data, the Boeing 738 crashed in poor visibility conditions, some 50-100 meters left of the runway,” the source said. A video recorded at the crash site reveals the Boeing-737-800 disintegrated on impact. Tiny pieces of the aircraft are scattered over a large part of the runway at Rostov-on-Don’s airport. An eyewitness, Arina Kozlova, who was driving near Rostov-on-Don Airport at the time of the crash, said the blaze from the explosion was so bright it was like having dawn in the middle of the night. CCTV camera footage posted on YouTube claims to have captured the moment of the explosion as the aircraft impacted the ground. However, its authenticity could not be immediately verified. All crew and passengers on board the plane were killed in the crash, according to the regional Emergencies Ministry. “During the landing approach a Boeing-737 crashed. It had 55 passengers on board. All of them died,” a regional spokesman told TASS. There were 55 passengers and seven crew members on board FlyDubai flight FZ981, Victor Yatsutsenko, head of EMERCOM National Crisis Management Centre (NCMC), confirmed during a press statement in Moscow. Seventeen were foreign citizens. “Eleven of the 55 passengers were citizens of foreign states and their names have already been identified. Six of seven crew members were also citizens of foreign states,” Yatsutsenko said. Ten of the 23 flights, scheduled to arrive at Rostov-on-Don, were canceled while three others landed in Krasnodar. The remaining 10 due in will also be redirected to Kransodar. “The plane, according to preliminary data, crashed during the second approach,” the source told Interfax. Spokesman for the southern bureau of Russia’s Investigative Committee, Oksana Kovrizhnaya, has put forward two versions of the crash: “Pilot error in deteriorating weather conditions or a technical failure,” she said. Both FZ981 flight data recorders have been recovered from the crash site. Experts are evaluating whether any data can be retrieved from them, said Vladimir Markin, spokesman for the Russia’s Investigative Committee (IC). The cockpit voice recorder was found in the morning and the parametric recorder was recovered later in the day. According Investigative Committee experts who examined the flight recorders, the black boxes are in a "normal condition," Oksana Kovrizhnaya said. She said the data would be extracted as soon as possible. 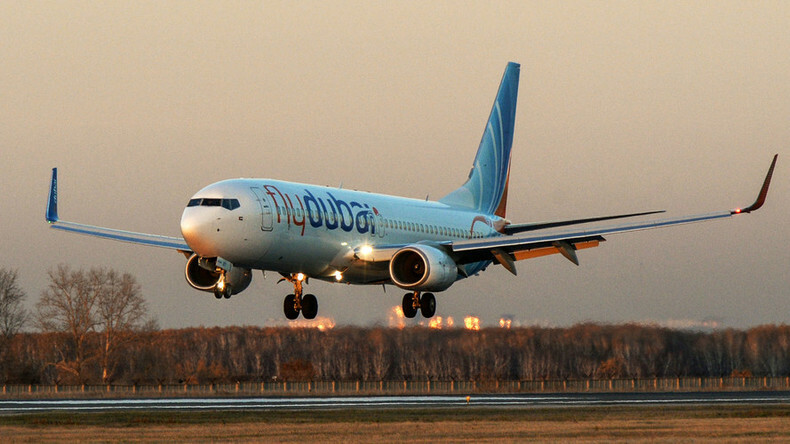 For the FlyDubai air company, which started operations in 2009, the crash in Rostov-on-Don was the first fatal incident in the company’s history. Ghaith Al-Ghaith, CEO of FlyDubai, has excluded the possibility of a terror act on ill-fated flight FZ981. No distress signal had been issued by the pilots either, he said. Al-Ghaith insists the captain, Aristos Socratous, was a highly experienced pilot with over 5,700 flight hours and that the plane was new. Manufactured in 2011, the aircraft passed its latest maintenance on January 21, 2016. Initial reports suggested that all passengers on board were Russians, however the Emergencies Ministry later confirmed that 11 foreigners were on board the flight, including all the crew members. FlyDubai says the passengers included 44 Russians, eight Ukrainians, two Indians and one Uzbekistani, altogether 55 people. LifeNews reports citizens of Cyprus (captain), Colombia, Kirgizia, Russia, Spain (2) and the Seychelles were among the crew members. The company confirmed that there were 62 people on board. The Russian Foreign Ministry has offered its condolences to the authorities of all states that lost citizens in flight FZ981, including Colombia, Cyprus, India, Kirgizia, the Seychelles, Spain, Ukraine and Uzbekistan. Contact has been established with relatives of 47 out of the 55 passengers on FlyDubai flight FZ981, the governor of the Rostov region Vasily Golubev reported. The relatives of the foreign citizens that died in the crash would be granted Russian visas using a simplified procedure, Transport Minister Maksim Sokolov told media. Forensic identification of FZ981 passengers might start as early as Saturday, Transport Minister Maksim Sokolov announced. Flight FZ981 from Dubai arrived in Rostov-on-Don at about 1:30am, but due to harsh weather conditions, strong side winds gusting at 25-30 meters per second, it spent the next two hours in the air, picking its moment to land. As FZ981 was cruising near Rostov-on-Don (ROV), several other flights opted for alternative airports, but the captain of FZ981 decided to wait for a chance to land at ROV. A record of what appears to be conversation of the pilot of the crashed Boeing-737-800 with the control tower in Rostov-on-Don has been published on the web. The FlyDubai company has issued an official statement about flight FZ981. Emergency crews are working at the scene of the crash and have already put out the fire, according to a TASS source. IC spokesman Vladimir Markin said "no less than 50" experts and experienced investigators are at the crash site, collecting evidence. “Site inspection is actively underway. IC investigators are collecting the remains of the passengers for subsequent forensic, genetic examination,” Markin said in a statement published on the Russian Investigative Committee’s official website. There are some 25 psychologists currently working with relatives of the crash victims at the airport. Thirteen are specialists from the Emergency Ministry, including the director of the Center for Emergency Psychological Aid, Yulia Shoigu told RT. Several hotline phone numbers have been opened in both Rostov-on-Don and Moscow, Shoigu added. The airport is to remain closed until at least March 20, 7:00am Moscow time. The inbound flights are getting rerouted to Krasnodar. The Emergencies Ministry has opened up a hotline while a team of psychologists has been sent to help the grieving relatives. Russian President Vladimir Putin has expressed has expressed condolences to the relatives and loved ones of the crashed Boeing. “The Russian president feels deeply for all those who lost their loved ones in the Boeing 737 crash in Rostov-on-Don,” Kremlin spokesman Dmitry Peskov announced on Saturday, stressing that the president has made it a priority to provide all possible assistance to the relatives of the victims. The Russian Defense Ministry has joined the recovery operation following the crash of the Boeing-737-800, it said in a statement. A military airfield, Rostov-Central, is ready to open its runway for Emergency Ministry aircraft, deploy engineering hardware and transport vehicles to help to clear the crash site, and take away debris. Military psychologists are working alongside other specialists at Rostov-on-Don Airport. Russia’s Investigative Committee has launched a probe into the incident with preliminary data indicating that the plane disintegrated and caught fire upon touching the ground. The head of the Emergency Ministry Vladimir Puchkov has held a special meeting, with all the ministry’s efforts, and resources of the local response teams and authorities, directed to the crash site. The Russian Emergency Ministry reports that over 850 specialists from various organizations are currently working at the crash site, along with 170 vehicles and hardware units. Transport Minister Maksim Sokolov said earlier that repairs to the airstrip in Rostov-on-Don would take at least 10 hours. Relatives of the victims are gathering at the airport, Vasily Golubev, governor of Rostov region, told media. He stressed that everyone will get sympathetic and personal attention. Golubev said most of the Russian passengers were tourists. The governor said the weather conditions at the crash site are better than they were at nighttime, and though it is still raining, the wind has weakened and the well-equipped response teams will continue to work while there is light.